Like a lot of kids, Keahi Seymour was fascinated with the way animals move and run. He was especially impressed with the ostrich and its wide, springy gait. Seymour wanted to create a book that would help him run like an ostrich. 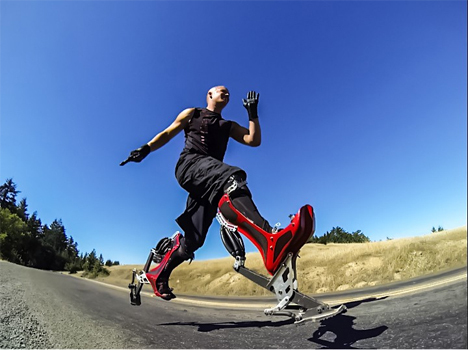 His idea took several years to come to fruition, but eventually he created the Bionic Boot, a working prototype of a crazily creative cybernetic running aid. 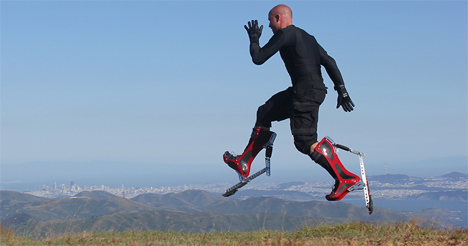 The Bionic Boots feature springs on the back that are meant to imitate the achilles tendon of an ostrich or kangaroo, giving the human wearer a greatly increased amount of force when running. 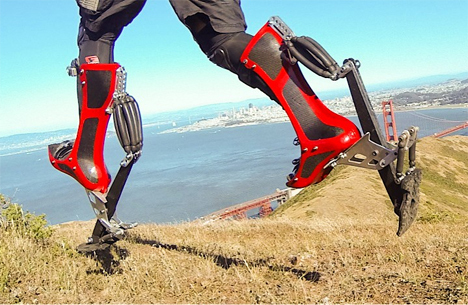 The increased force propels the wearer forward faster than non-augmented human legs could. Strapping on the boots and going for a run looks like a blast, and according to Seymour they can help you run at speeds up to 25 miles per hour. He hopes to go even faster in the future. 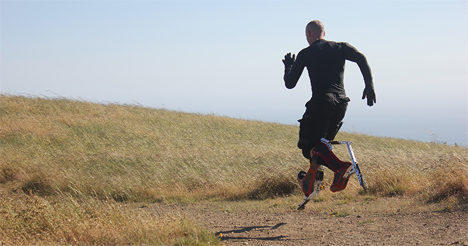 The inventor says that the exaggerated arm movements in the video are just for demonstration purposes, and when you’re running for fun or exercise the movements are much more natural. Although he’s put quite a bit of work into the concept so far, Mr. Seymour has no immediate plans to produce and sell the Bionic Boot. He has made appearances at Maker Faires, though, showing off his invention and sprinting around like a very happy ostrich. See more in Cybernetics or under Technology. October, 2014.